This one done together with 4 other people. <a href=”http://ageofpeder.dk/”>Peder Riis</A>, <a href=”http://lupus-ignis.dk/”>Tore Sæderup</A>, <a href=”http://sajmonsays.blogspot.dk/”>Simon Petersen</A> and <a href=”http://cheesopath.blogspot.dk/”>Rikke Hollænder</A>. This one was done from three keywords: “Absinthe”, “bottom of the sea” and “noble lady”. The first page was one of those I spend way too much time on. As always I ended up cutting down on details later. 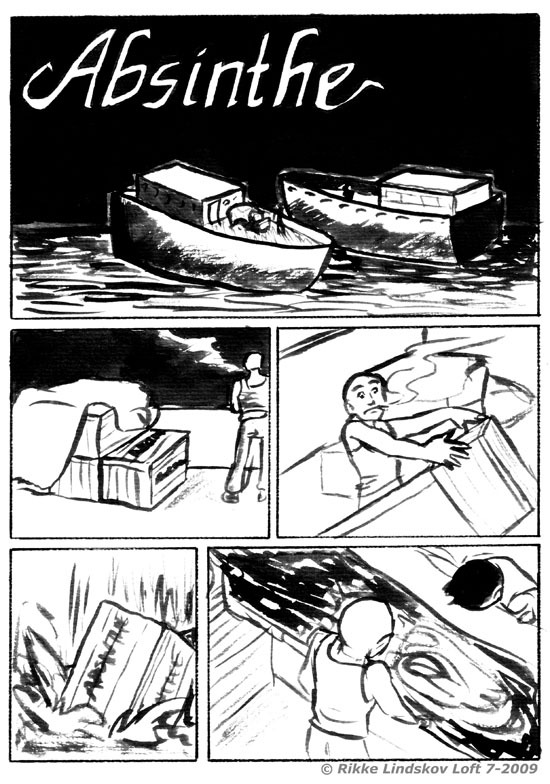 This ended up being a silent comic by pure accident. I originally started with text on page one, but after realizing none of the other pages needed it, I figured it’d be suitable to go all the way.